As you enter this wonderful park, check the large field on your left for American Kestrel, Eastern Bluebird and Loggerhead Shrike. Stop at the park office to obtain a map and bird checklist and to pay the entrance fee. Otter Springs is a second-magnitude spring and is popular with swimmers and paddlers, but during less busy times you may encounter Limpkins and other wading birds. Look skyward for Mississippi and Swallow-tailed Kite; Red-shouldered Hawk, and Broad-winged Hawk, are possible too. A canoe launch and rental canoes are available at the head of the spring run. The park has more than 5 miles of well-marked, well-maintained, multi-use trails from which you can explore a variety of habitats such as bottomland and floodplain forest, swamp, upland mixed forest, pine flatwoods and sandhills. Golf carts are allowed on the trails too. Typically, the trails are lightly traveled. Take the Little Otter Trail down to a second spring (Little Otter Spring) by the river; along the way, watch and listen for breeding birds like Barred Owl, Pileated Woodpecker, and Prothonotary Warbler. Check the Palmetto Loop Trail and the Sandhill Trail loop for Wild Turkeys, and Gopher Tortoise. A southerly spur off the Sandhill Trail lets you check the large field along the entrance road for winter sparrows. 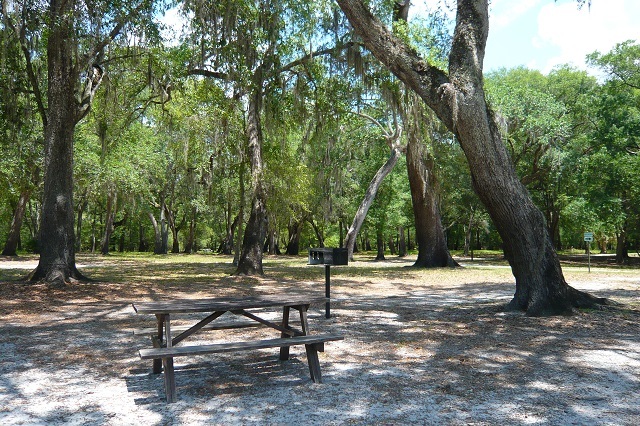 This very family friendly park has cabins and numerous camping options available.